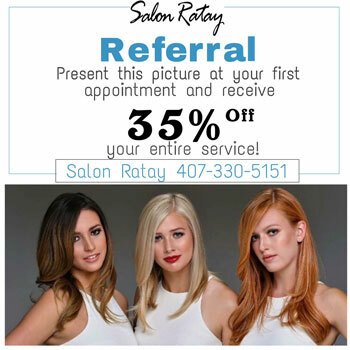 Salon Ratay is located in the beautiful Lake Mary FL (Orlando Area). Salon Ratay is committed to being a progressive leader in the beauty industry. Through cutting edge product knowledge and education, we will create an environment of excellence for our staff and our guests. We will reach above and beyond our guest’s expectations and create a luxurious experience for all who visit our salon. We recognize that each guest is unique and therefore has individual needs that our staff is committed to meeting. The Salon Ratay Experience is centered around our clients feeling beautiful, inside and out. I have had so many compliments on my hair color. Sherry does my color and it is the best it has looked since I lost my long time stylist 5 years ago. I have tried several people from other salons that could not get it right before I was referred to Sherry at Salon Ratay by a good friend. I have been a customer of Salon Ratay for 16 years. Sherry takes the time to determine what you are looking for and your life style. She has the talent and vision to give you your best look ever! Sherry is the only person who has colored my hair. When she asks what I would like to see with my color I always ask for her suggestion and go with it ! She personally trains her staff and it shows with the expertise and professionalism you see in each. I have received several compliments over the years......one person asking me if that was my natural hair color because it was absolutely beautiful. Thank you Salon Ratay! I have been a customer of Sherry's for almost 17 years. I can't say enough about her ability to have a vision for her customers and the talent she has to achieve that goal. I have trusted her to take me from a frosted blonde (fixing what I arrived with 17 years ago) to warm blonde hues and finally to a beautiful ombre. As you can see I really have only changed my hair color 3 times in 17 years. I'm just that daring! ha So when Sherry suggests that I make a change (something I don't easily jump into) there is no one else I would trust! I plan to be a lifer at Salon Ratay! Have followed Sherry Ratay for a number of years prior to the opening of Salon Ratay. Sherry is an incredible professional. She is a perfectionist, up to date and continues to always be the best for her clients. The staff at Salon Ratay can be rated better than 5 Star. All have had to endure rigorous training by Sherry to make up a well coordinated team of experts. A day at SALON RATAY for my wife and I is a HAPPY DAY. I have been going to Salon Ratay for many years, maybe back when it was newly started. There really is no other salon like it. Sherry has her staff highly trained, where she personally trains all new employees. They are constantly keeping up their skills and staying on top of the trends by attending and hosting seminars. And, it shows. Their skills in coloring and cutting are excellent. I have never had to wait for an appointment. I have also never had trouble booking an appointment on the day and time convenient for me. Super great salon!! I have been a client for years and highly recommend this salon. Every person in the salon is very professional, as well as being friendly. I never worry about the results of my visit. My color, cuts and styling always meet or exceed my expectations. My entire family comes to Salon Ratay. We have always had a positive experience. Sherry and staff are well educated on the latest trends. I feel confident that my hair will not get destroyed as I have experienced first hand at another salon. They come highly recommended! Thanks to Sherry and the talented staff at Salon Ratay, I never have to worry about having a "bad hair day." At the beginning of each salon visit, the staff always consults with me about what is/isn't working for me and my hair. Salon Ratay provides consistent high quality service that creates personalized color, cut and styling to fit me and my lifestyle (and my own lack of personal hair styling skills) perfectly. The amazing color and fabulous cut means that even in my unskilled hands, my hair always looks great! I have been a client for many many years. I think Sherry Ratay the owner of Salon Ratay has a great staff and spends allot of time training them to be the best in the business. She has been in business a long time and shares her knowledge with her employees. Education and training doesn't come free. It is a high end salon but you get what you pay for. So if your looking for the newest and latest in design and color and never compromising the integrity of the condition of you hair, Salon Ratay is the salon for you.